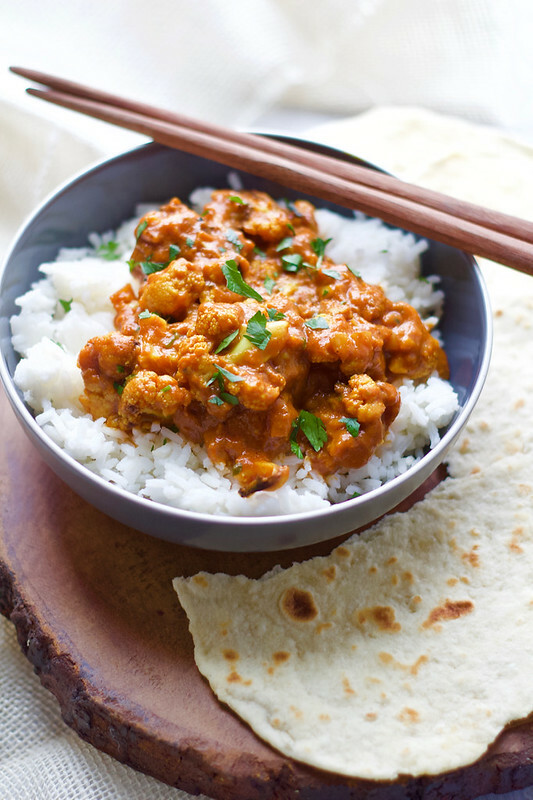 So, this recipe has a healthier twist compared to your classic butter chicken. Yes, this is meat free. Cauliflower has been swapped for the chicken, and coconut milk for the butter. But the flavor hasn’t been diminished with all the swaps. 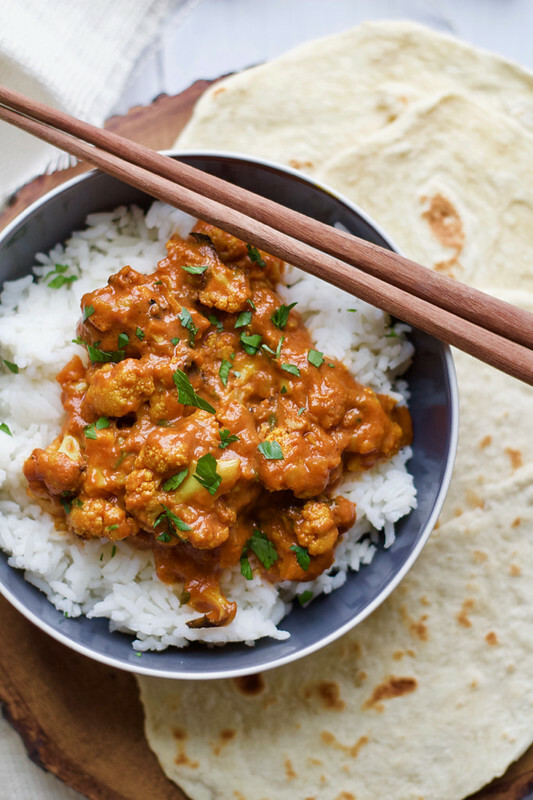 It’s creamy as ever and you’ll barely even notice that you’re eating cauliflower instead of chicken. This is a meal you’ll walk away from incredibly satisfied. I chose to serve this over white rice with flatbread on the side. Brown rice or barely would also be an excellent choice. Preheat the broiler to high. Line a baking sheet with parchment or tinfoil and set aside. In a large bowl, combine the cauliflower, 1/3 cup coconut milk, 2 cloves chopped garlic, 1 tablespoon grated ginger, and a pinch of salt. Let sit 10 minutes to marinate. Spread the cauliflower in an even layer on the prepared baking sheet. Transfer to the oven and broil for 3-4 minutes, or until the cauliflower is just beginning to brown on the edges. Meanwhile, heat the olive oil in a large skillet over medium heat. Add the onion and cook for 5 minutes, stirring often, until softened. Add the remaining garlic and ginger, cooking another 5 minutes. Stir in the curry powder, turmeric, and cayenne, and cook until fragrant, about 1 minute. Stir in the tomato paste and remaining 2 cups coconut milk. Bring the sauce to a boil, cook 5 minutes or until the sauce thickens slightly. Stir in coconut oil. Mix in the cooked cauliflower and cook, stirring occasionally, until the sauce thickens slightly, about 5 minutes. Remove from the heat and stir in the cilantro. Season with salt and pepper. 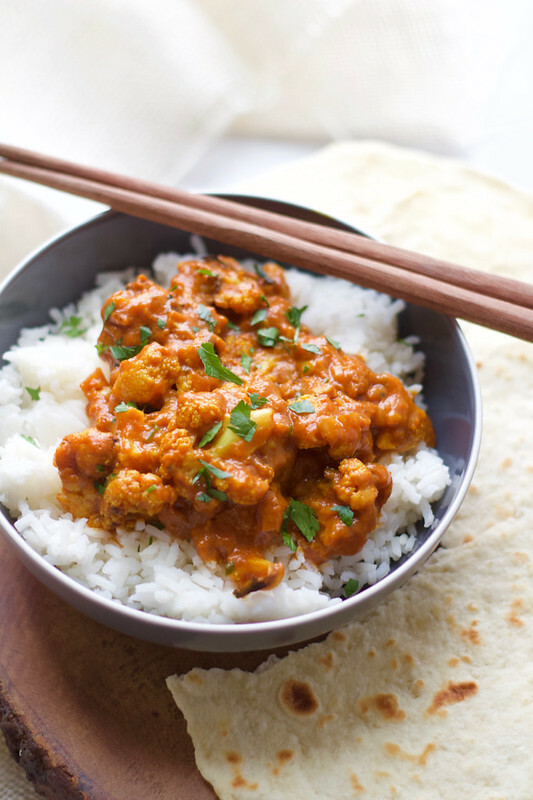 Spoon the cauliflower and sauce over bowls of rice with fresh naan.